Motorcycling, like most disciplines, fragments and shards into a myriad of subcultures. Each has it’s own rituals, practices and gear preference. Through these islands of adaptation, one can always find a common thread that weaves the fabric of understanding. It’s the same thread that fosters a two-fingered wave or head nod to your fellow rider. I’d like to shine some light on a topic that I continue to observe in motorcycling, namely minimalism. One of the motivations behind throwing your leg over the bike is the simplicity of it all. This math motivates riders to roll regardless of the weather (hot, cold or rainy). A motorcyclist knows the value of windshield wipers and doesn’t take it for granted. A motorcyclist, aware of the luxury afforded by climate control, heated seats and air fresheners chooses to forego. 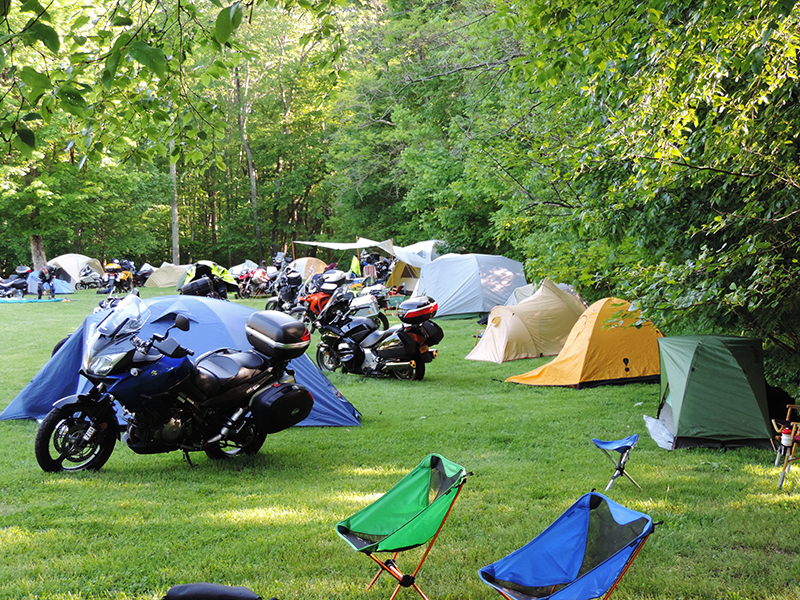 Perhaps this is why camping is pervasive among the motorcycling community. The outdoors, camping and all of the challenges that come with parallel the motivation that drives one to ride. 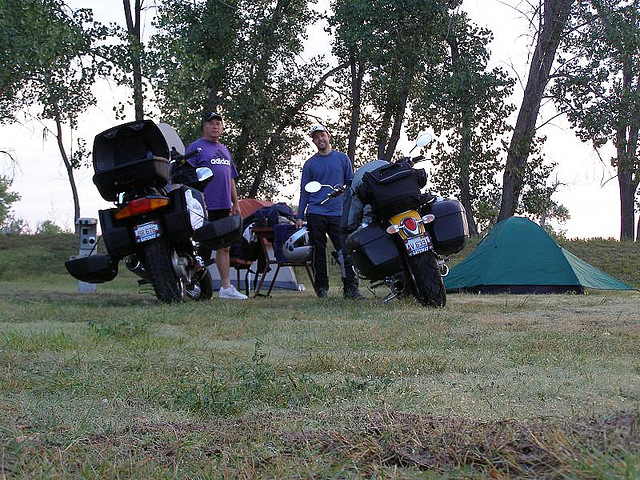 I first experienced the challenge and reward of motorcycle camping when I rode with my father-in-law from Arlington, Virginia to Wyoming. While calculating what was necessary for the trip was challenging, it was a rewarding engineering exercise. 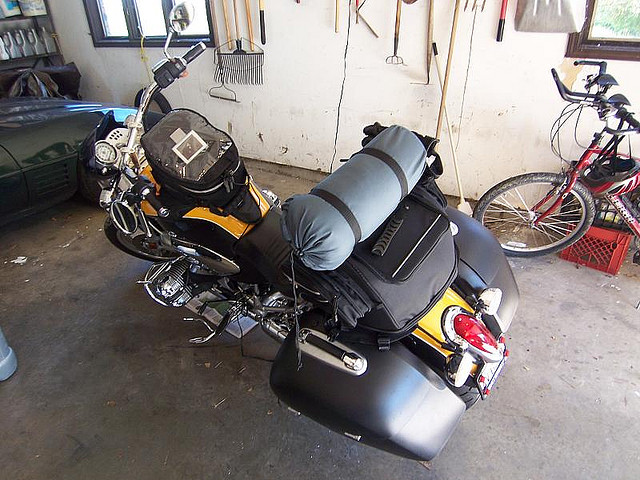 At the time I rode a BMW R12000C cruiser and was able to pack enough kit to get me 3/4 of the way across the country. Since that trip, camping via motorcycle has become a rite of passage and a release from the stresses of work and city life. My wife and I pack up on any given Thursday or Friday night, organizing the gear for each bike on the kitchen floor before loading up. Each bike is then outfitted like a mechanical mule, tied down with cargo nets and bungee cords. We enjoy the packing process itself, being engineers and all. 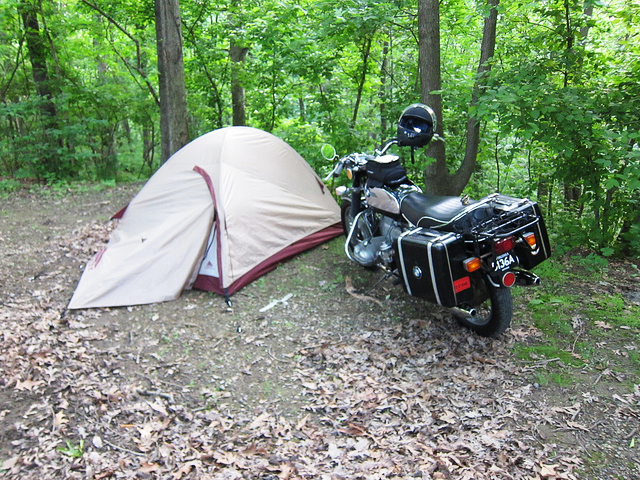 Since I ride both with my wife and without, the two-person tent is perfect. When she’s along for the trip, it works to house both of us and our gear is stored in the vestibule. When I’m alone, there is ample room for my gear in the tent. The sleeping pads are important for insulation from the ground. Even in summer, the ground in the mountains can be cold, the air gap also helps cushion uneven surfaces. Pillows are a bit luxurious but they store small. The hammock is a bonus! A two person hammock can pack as small as a softball and makes for a great napping spot after a long ride. Some double as a tent rain fly. Finally, we always have our collapsible chairs. They make the best part of camping, namely sitting around the fire, much more enjoyable. The chairs are definitely worth the spend and the space. You need a good knife. That isn’t just a lesson for camping. It’s a lesson for life. If there is one thing you should pay extra for quality from camping gear perspective, it’s your knife. Buy a good one and take care of it. Lighting and rope are essential. You don’t need much rope but it will come in handy. I originally started carrying rope to raise my gear off the ground due to bears but have found additional uses for it since. Keeping with the minimalist theme, we’re pretty simple with our food choices. Black beans (or chili) and couscous with slivered almonds are a good option. They keep/pack well, cooking easily. Alternatively, we’re also known to bring “just add water” instant meals which you can find at your local backpacking store. Watch these, though as they typically carry a tremendous calorie count. If you’re not hiking or climbing as part of your trip, these can be overkill whereas pistachios are just table stakes. I’m an early riser, I usually have a granola bar and a coffee or two before everyone else starts rustling around in their tents. 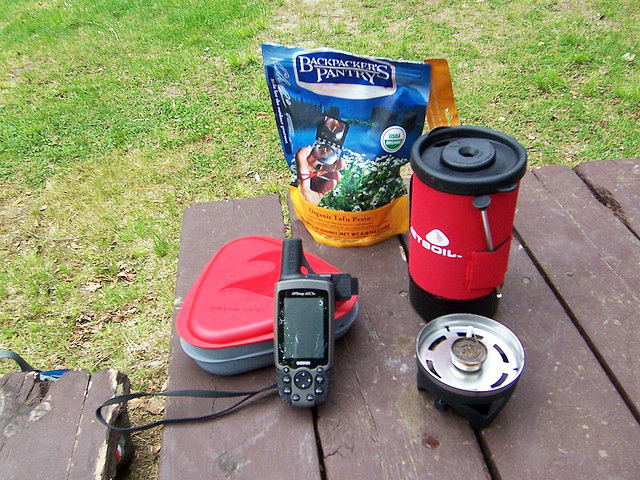 For coffee, I use my JetBoil and a Starbucks Via coffee pack. The JetBoil comes with a French press mechanism but I’ve found the Via to be a tasty (and more convenient) alternative to ground coffee. Finding a suitable destination is part of the adventure. Living in the mid-Atlantic, we have the Blue Ridge Mountains, the Shenandoah Valley, the Potomac, Rappahannock and Rapidian rivers. The Chesapeake Bay is not a far ride. We’re fortunate to have so many options as weekend destinations. Regardless of where you’re launching from, the ride and campfire are what it’s about. Pick a destination that gives you options on your return trip, perhaps a favorite out-of-the-way lunch spot, a farmers market or antique shop. Better yet, coordinate your ride with another motorcycle event, show or club meeting. A little bit of planning and Google search can turn any weekend into an adventure. What more does one need in life? 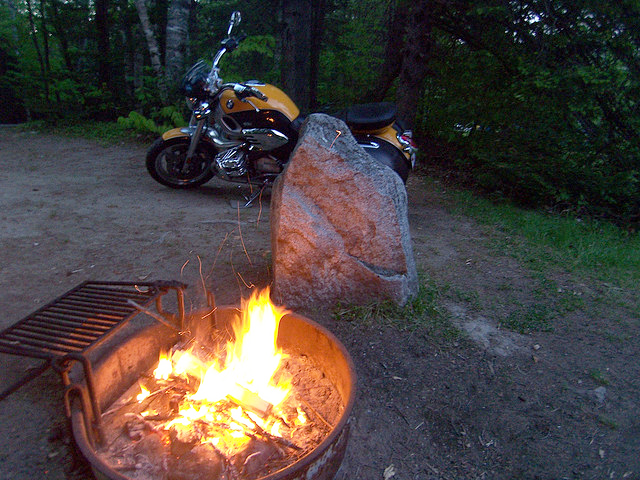 Motorcycle camping is a spirited ride on the open road, fresh air, relaxation, nature and an evening with friends around the campfire. Be sure to park your motorcycle nearby so that it might reflect the flames, reminding you why you ride. 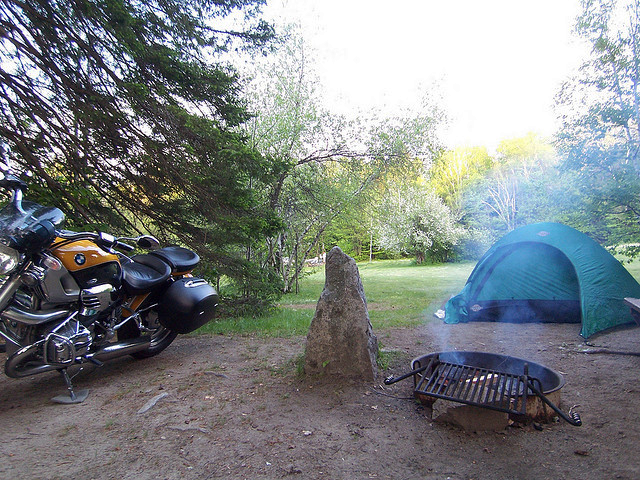 What Are Some Of Your Favorite Motorcycle Camping Destinations? 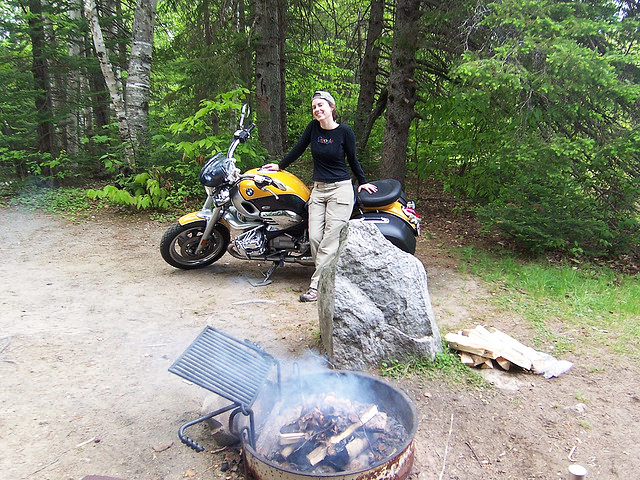 There are many camper-friendly motorcycle routes out there. Which have you ridden? What do you like about them and why? Your input is invited. Post an article! Fellow rider and guest author Kurtis Minder has posted a total of 1 article.